Egyptian media coverage of the clearance of protest camps occupied by supporters of deposed president Mohammed Morsi has been deeply divergent. It reflects the high polarisation of the media environment in Egypt, with TV stations backing either ex-President Morsi or the army that removed him, with little middle ground. All of the main TV channels interrupted their regular programming to carry dramatic live relays from protest locations across Cairo, and there was no mistaking their political slant. State-run media and some private TV stations are fiercely anti-Morsi, stressing that his supporters were armed and have caused casualties among the police. Muslim Brotherhood-affiliated stations, on the other hand, reserve their ire for the army that deposed the president. They highlight deaths among the protesters, showing gruesome pictures of the dead and wounded. The Muslim Brotherhood TV stations Ahrar 25 and Al-Shar'iyah have been showing a continuous live feed from Rabaa al-Adawiya, one of the focal points of pro-Morsi demonstrations. The relay features intensely emotional and rousing speeches delivered by Islamists addressing the sit-in. The demonstrators respond with frequent chants of "God is great", with gunfire heard in the background. "Our fight is for the sake of God," said one speaker in Rabaa al-Adawiya. "We will sacrifice our souls and blood for Islam!" Footage of protesters milling in the square is interspersed with video clips showing piles of dead bodies and even several charred carcasses. At one point, a man appeared to die on camera in a live Ahrar 25 broadcast. One of the urgent screen captions carried by Ahrar 25 and Al-Shar'iyah said: "We cannot count the number of martyrs filling all of the mosque's rooms, and we cannot take them outside the square." State TV stations such as Channel One and Nile News, as well as private ON TV and CBC, also carried live footage of how the pro-Morsi camps were cleared. They are, however, harshly critical of the Islamist demonstrators, claiming that they are armed and have killed several members of the armed forces. Throughout the day, the anti-Morsi TV stations have been carrying tumultuous live footage of unrest across Cairo, much of it filmed from high vantage points. In video shown by ON TV, demonstrators were seen throwing stones at police, trying to wreck police cars, setting up barricades, and so on. In one incident shown by the channel, protesters tried to roll a crashed bus down a flyover towards a police line - an act which triggered a police charge against them. Later, an armoured vehicle was seen crashing upside down on the ground below after being thrown off the top of the flyover. Nile News said five security officers were inside it. 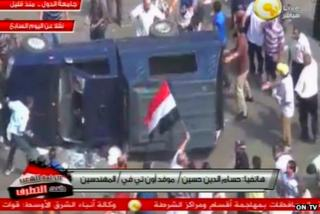 Nile News has also been showing clips of security officers patrolling streets and detaining protesters. Also unlike Muslim Brotherhood TV stations, state and major private TV stations broadcast interviews with commentators, many of whom welcome the move by the security forces. One analyst told CBC that events on 14 August reminded him of when Egypt waged a war against Israel to recapture the Sinai Peninsula in 1973. Another commentator, former leading Muslim Brotherhood figure Kamil al-Hilbawi, told Channel One that the army's actions were "acceptable", but feared that Egypt's problems were far from over. "Continued violence will lead to chaos, and if chaos prevails, I'm afraid we will turn into Syria," he said.